Brighten your rooms . Put higher wattage bulbs in light fixtures to brighten up rooms and basements. Replace any burned-out bulbs in closets. Clean the walls, or better yet, brush on a fresh coat of neutral color paint. Send your pets to a neighbor or take them outside. If that's not possible, crate them or confine them to one room (ideally in the basement), and let the real estate practitioner know where they'll be to e liminate surprises. 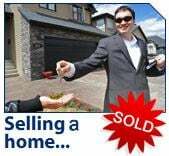 Please contact me if you have any questions about selling your Grande Prairie home.